This post was kindly written by Deidre Simmons, who is currently in the second half of her six month stay in St Chinian. Thank you, Deidre, for sharing your passion with us all! It was not our intention to do a lot of shopping while living dans le sud de la France. After all, it is costing us a bit to maintain two homes plus travel and enjoy the delicious food and wine. And we prefer not to spend a lot of money on “stuff”. BUT I have discovered the magic of the French brocante et salons d’antiquaires. I got hooked when I decided I wanted a tarte tatin pan for the traditional apple tart recipe I had found on the Midihideways blog. It was early December, but it turned out we were just in time for the annual Grand Déballage (this translates as ‘big unpacking’, very much like a jumble or garage sale) which is usually held in nearby Pézenas on the 2nd Sunday in October but had been postponed this year. Lucky for us – but it meant a cooler day, albeit sunny. The city of Pézenas is known for its antiques, and the many shops of second-hand goods and antique dealers are open throughout the year. Furniture, old linen, jewellery, crockery, paintings, trinkets, African art, art deco, watches, books and posters, and an interesting selection of 1950s era furniture, china, and household items are available. The colourful and “exotic” second-hand market we attended extended over a kilometre, with over 150 exhibitors. Many just had blankets laid out along the street, covered with bits and pieces. Others were more serious with tables or cupboards full of goodies. 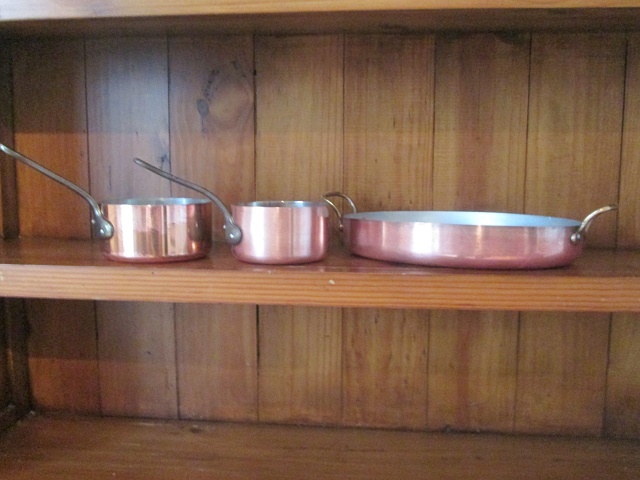 I was looking for copper – remember the tarte tatin pan?. There was not much in evidence but we did notice that items near the entrance had higher prices than further along. About half way into the melee, I saw a set of three copper pots. The man wanted 30 euros – for them all! A good price but not quite what I was looking for, so onward. Looking for anything specific among the melange of objects on display is a bit like trying to find “Waldo”. It was a cool day so everyone was bundled up. 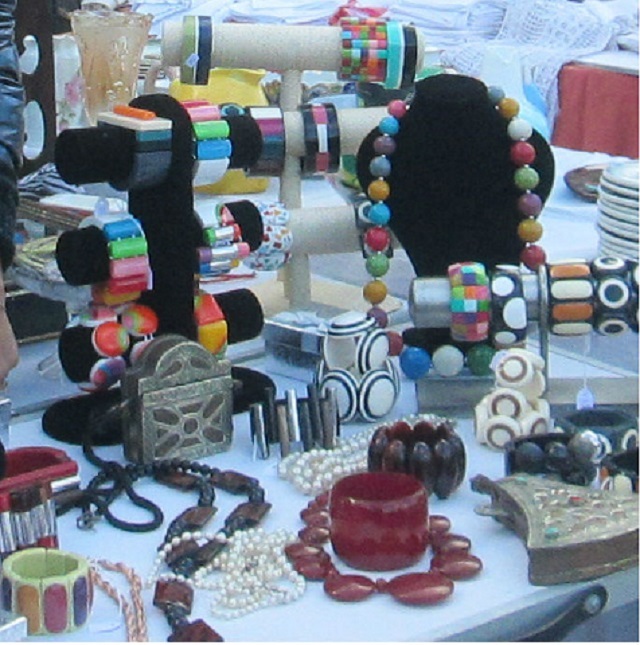 This lady was selling retro bakelite jewelry from the ’50s – or so she said. It is a bit hard to identify bakelite from plastic, but her merchandise was very nice and included some interesting colour combinations and designs. We had a good look through the bracelets and eventually bought two for gifts. Along we strolled, looking at no end of strange and unusual “antiques”. We were impressed that there were these guns for sale – no one worried about them lying out there for all to fondle. We turned a corner and came upon a jazz ensemble adding music to the atmosphere. But it was lunchtime, and in France, lunch means eating and the ubiquitous bottle of wine – and family time. 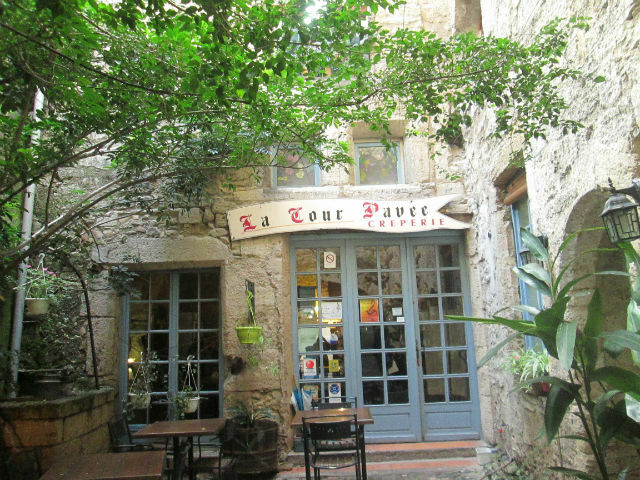 Along a little lane off the antique row, we found Crêperie la Cour Pavee, where we enjoyed traditional Brittany-style galettes and crêpes with traditional cider. Can you imagine the taste of a salted butter caramel crêpe? Back to the Grand Déballage – we returned to our search back along the way we came and stopped again to look at the copper pots. I decided I might be able to pack one in a suitcase so offered 10 euros for the smallest. Now I am the happy owner of a perfect little saucepan. What an exciting day! And there is more…. 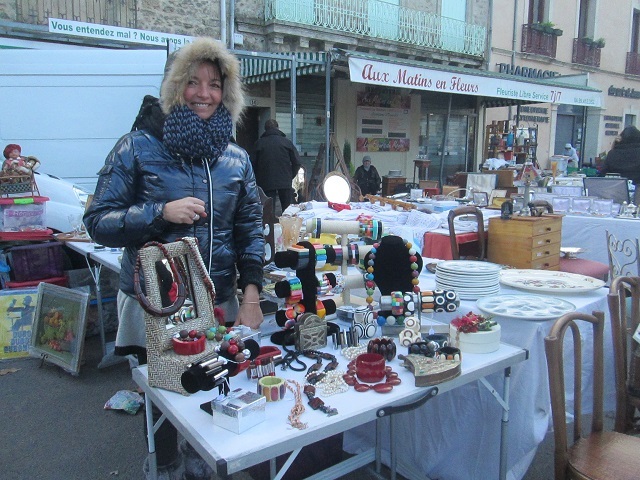 About a week or two later, we read about the oldest and the biggest fleamarket of Montpellier – Marche aux Puces. On arriving, we were a bit disappointed to find more of a garage sale en masse with mostly second hand clothes and shoes, etc. And the culture was definitely more middle eastern than French. But, there were some treasures to be found among the mish mash, with a lot of careful looking. I, surprisingly, found an oval copper pan with brass handles in very good shape for 10 euros. We also found a set of speakers to use on the computer when we want to watch movies. 8 euros and, miracle of miracles, when we got home they worked!! 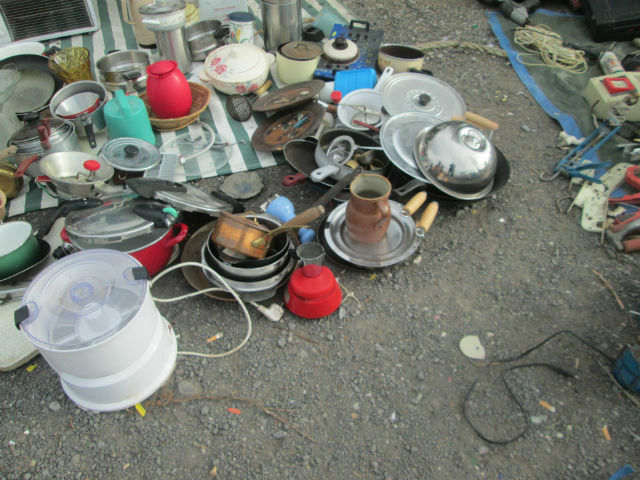 Just a little further along, I found another set of copper pots on a mat among a lot of useless items. This time a set of 5 for 20 euros. Again, I did not want five pots. But there were two that were very nice, with stainless steel lining, which apparently is a good thing. They were about the same size as the one I had already bought but since I was able to “bargain” the owner to sell me the best two for 10 euros (I know, that was not exactly bargaining) I now have another copper pot a bit larger and have gifted the smaller one to my “foodie” friend. I still do not have a tarte tatin pan but I will keep looking. Now I am getting excited about antique shopping. On a return visit to Pézenas, we went into Les Antiquaires de l’Hotel Genieys. It really is a beautiful shop, and at the back is a room full of antique linens. 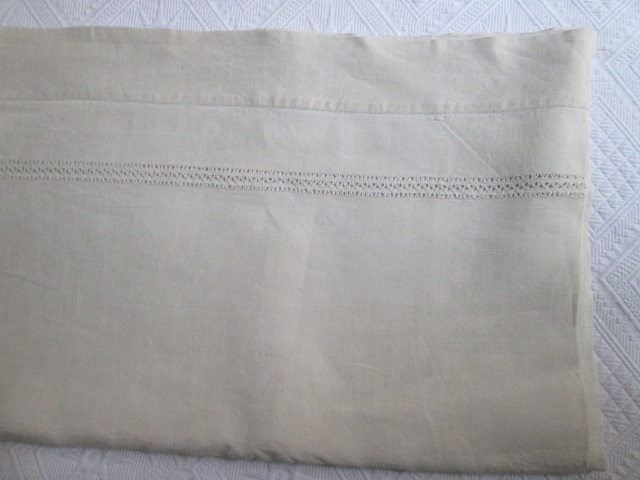 Once I started sorting through and feeling the softness of washed linen, I could not resist. I started looking at sheets for about 150 euros but digging through the pile found a very nice one in a natural colour (not bleached) for 30 euros. It is huge – 320cm x 280cm or 126 x 110 inches – bigger than the usual North American queen size – 267cm x 280cm or 105 × 110 inches. The most common and most desirable sheets are the white matrimonial monogrammed sheets, traditionally embroidered by a future bride for her trousseau. If you are interested, check out this website http://fleurdandeol.com. On a very cold Saturday in Marseillan Plage, I found one (with the odd initials A O). The extremely cold vendor, trying to keep warm in his truck when I dragged him out to unfold the sheets so that I could check the quality, was not into bargaining. I happily paid his asked for 20 euros. My photos do not do them justice. The sheets need to be washed and ironed, but it’s wonderful to imagine them on our bed at home. The natural coloured one will probably be used as a topper. I am now on a search for pillow shams! When we have to return home after this French adventure, for sure our suitcases will be overflowing and we will probably have to send a box of stuff home by post. BUT, we have some great souvenirs and more good stories. PS: We did not buy these!